"Siberian Tigress, we will lead your cry thereby the deaf and heartless people must hear." This beautiful tiger on the picture, originally born in the wild, bought from Russia, even doesn't have a name. She is held for over 4 years in an underground quarantine in Eram/Iran now, meant to be there till death. Because there is the suspicion that she might have a contagious disease even if she is showing the best healthy situation, she is left suffering everyday and every night in a cellar. The responsible authorities in Iran even don't allow the needed blood test to confirm any suspicions. Please read the petition letter written in Farsi and English for more information. Get updates in the facebookgroup by clicking here. Tigers don't belong in captivity. We are against any business with wild animals. We ask the authorities to take responsibility and prove the case so that the tiger without name can be removed from the cellar to a natural place. Please give the tiger a voice simply with your signature. Thank you! به گفته دامپزشک باغ وحش ارم تهران : ببر ماده سیبری که به همراه یک ببر نر به جای پلنگ های ایرانی از روسیه به ایران آمدند. در بدو ورود بعلت بی برنامگی و عدم وجود جایگاه به صورت موقت به باغ وحش تهران رفته و در طی یک فاجعه قابل پیشگیری هم ببرهای تازه وارد و هم تمامی شیرها با گوشت آلوده تغذیه شدند و به بیماری مشمشه دچار شدند. در آن زمان باغ وحش تهران تعداد زیادی شیر داشته این ۲ ببر و سایر گوشتخواران هم بوده اند که روزانه بیش از یک خر غذای آنها بوده. در آن روز لاشه حیوان مریض به تمام گوشتخواران نمی رسد و برخی بیمار می شوند و برخی خیر. علاپم بیماری در شیرها شروع می شود ولی حیوانی تلف نمی شود تا درمان های کورتونی انجام می شوند و باعث تضعیف ایمنی و مرگ یک شیر نر بزرگ می شود. متاسفانه برای ببر نر هم بعد دیدن علاپم همین درمان ها صورت می پذیرد که منجر به مرگ حیوان می شود. بعد از مرگ ببر نر باکتری بورخوردریا مالئی جدا شده و بیماری مشمشه تایید می شود. تعدادی از گوشت خواران در آن زمان علائم داشته و تعدادی فاقد علائم بوده اند که سازمان دامپزشکی و محیط زیست تصمیم به انجام آزمایش بر روی تمام آنها می گیرد. نمونه ها به آلمان ارسال می گردد البته همه به نام ببر ! در حالی که در آن زمان تنها ۲ ببر در باغ وحش تهران بوده ۱۸ نمونه ببر ارسال شده و بعد از جواب ها اعلام می کنند که علاوه بر شیرها ببر ماده هم آلوده است گرچه هیچ گونه علائمی نداشته و ندارد. شیرهای بالغ بعد از تزریق میزان کمی دارو مقید شده و سر بریده می شوند و شیرهای کوچکتر سوزانده می شوند. ببر ماده به علت رسانه ای شدن موضوع و با پافشاری سازمان محیط زیست جان در می برد ولی چه جان در بردنی در قرنطینه ای کوچک در خرابه های ارم ۴ سال می ماند تا در کش مکشی که بین سازمان دامپزشکی و وزارت بهداشت از یک طرف و سازمان محیط زیست از طرف دیگر وجود دارد در قرنطینه بپوسد و خود بمیرد. بدون شک بهترین اتفاق برای سازمان های مربوط مرگ خود به خود حیوان در این شرایط بد بود تا کسی مقصر نباشد ولی این حیوان قوی در این مدت با تمام این شرایط نه تنها علائمی از بیماری نشان نداده بلکه کاملا سالم و سر حال است! سال گذشته تصاویری از این ببر به همراه گزارشی از وضعیت بالینی این حیوان برای اتحادیه باغ وحش های اروپا و ای یو سی ان فرستادم که ماجرا را توضیح دادم و رئیس این اتحادیه طی نامه ای با اشاره به این موضوع که این حیوان از نظر ژنتیکی بسیار با اهمیت است و در اساد بوک آنها ثبت شده درخواست کرد نمونه خون از حیوان اخذ و به آلمان ارسال شود تا در صورت پاک بودن از این شرایط رهایی یابد و به درون باغ وحش در شرایط استاندارد انتقال یابد و حتی جفت نر حیوان توسط این اتحادیه تامین گردد و در صورت آلوده بودن تست مجدد صورت گیرد و در نهایت راحت شود. در جلسه ای که بعد از دریافت این نامه توسط سازمان های مربوط برقرار شد وزارت بهداشت کماکان بر موضع خود که بهداشت عمومی بود پافشاری نمود و گفت جواب آزمایش جدید هر چه باشد این حیوان از نظر ما آلوده است و باید معدوم شود (البته بارها به ایراد کلمه معدم کردن خورده گرفتم که فایده ای نداشت) با توجه به اینکه وزارت بهداشت از طرف بهداشت مردم سخن می گوید دو سازمان دیگر زبان در کام گرفتند و ببر بیچاره نه راحت خواهد شد که هیچ سازمانی جرات این کار را ندارد و نه آزاد خواهد شد کماکان منتظر هستند که خود حیوان بمیرد! Unaccompanied Tigress A female Siberian tiger, tigress, that has come along with another male to Iran against Iranian panther soon after arrival, because of sensible planning and without a temporary space for maintenance, during a disaster that could be avoided, they were feed with some lions with infected meat and therefore they got "Glanders disease" all together. In that time had the "Tehran Zoo Garden" many lions. These two tigers with others animals had to eat a donkey during a days as their meal. The dead donkey was "Sick" and it was not enough for everyone and because of that fact all the animals could not impaling it. So that's why some get sick but some will not. After this one event lions starts to show symptoms of the disease. But none of the animals are dead until the animal keepers begins with a "Cortisone" treatment. This treatment with cortisone is going to be the reason for the health and safety of a huge lion is at risk and that's why he dies. Unfortunately, such a treatment will come again once more time as a reason for an unwieldy male tiger also die. After tiger's death is perceived that bacteria "Pseudomonas mallei" has been resolved, and so therefore confirmed that disease Glanders came to prove. During this time some of the animals had symptoms and some of them did not. The "Iranian Veterinary Organization" and the "Department of Environment" then decides to investigate a thorough scientific experiments. Samples of the test is sent to Germany but all for tigers name! 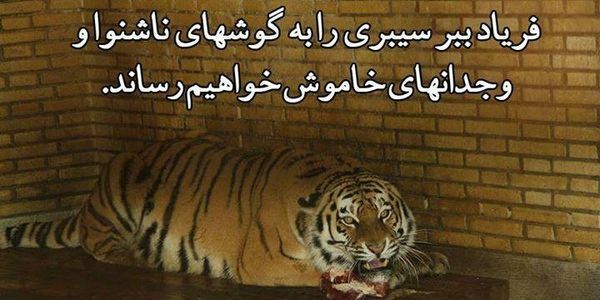 Although there were only two tigers in the Tehran zoo. And once been late 18 samples of tigers and then comes answer is published that a lion is also affected, though the tigress had no symptoms. All sick lions after treatment becomes quiet and calm and then they all get beheaded. But all those little lions gets burned. One of the tigers it was female it means tigress she could survive. But what further survival? She kept in one of the ruins s Eram until she under a wide range of bulk suction between the "Veterinary Organization" and the "Ministry of Health" gradually to-wear out and die of themselves, even though she was first supported by the "Department of Environment". The best event for all these relevant organizations was without a doubt that they sick animals die by itself in a bad position. So none of the organizations face becomes a demanding public responsibility. Under all these circumstances and after the time passed this strong "Tigress" not only knew the symptoms of the "Glanders disease" but she appears quite fresh and healthy! Last year I sent some pictures of the tigress along with a summary of her clinical position to "IUCN" and "Union zoo in Europe" and I have comment about what was going on. Chairman, the responsible person in "Union zoo in Europe" by sending a letter pointed out on this topic that this animal is quite important in terms of her genetic typical and pointed also to it that this issue is registered in their "Esat book". Chairman request me to get a blood test and send it to Germany. So if it is clean tigress released from this bad position, and she been transported to a default situation and bear a male tiger to her using the "Union". but if she is infected we get again another blood test and finally the tigress sent to an eternal rest. After this letter all these relevant organizations hold a meeting. In this regard, "Ministry of Health" insisted its decision and it should be an observance of "General hygiene". "Ministry of Health" said that whatever the blood sample is, tigress is affected by the "Glander disease" and she must be eliminated. I complained many times the word "Elimination" but without success. Compared to the "Ministry of Health" always talk to the people's health to good these two organizations hold their mouth quiet. Now do not get this hopeless tigress neither a calm situation and she becomes rather not free. No organization has the enough courage to do something. All are still waiting that she dies by her self.